Web Site Purpose: Provides information on outdoor lighting to citizens of Fort Bend and Brazoria Counties including the latest information regarding who is and is not protecting their rights to responsible outdoor lighting, the status of their outdoor light ordinances, and what they can do to help protect their night environment. Why a Light Ordinance? An outdoor light ordinance establishes community standards for outdoor lighting that not only protects the night sky from excessive light pollution, but also promotes safety and energy conservation, reduces light trespass preserving adjacent land value, and even helps protect the environment for noctunal animals. Proper outdoor lighting usually means better lighting with less energy which translates into cost savings. Unfortunately, most people installing outdoor lighting, including lighting designers, are not informed of what constitutes good outdoor lighting, hence the need for a county ordinance that establishes a community standard. The Fort Bend and Brazoria County Commissioners Courts were granted the power to pass light ordinances with the passage of HB 164 in the Texas state government to protect the George Observatory in Fort Bend County, close to the Brazoria County line. 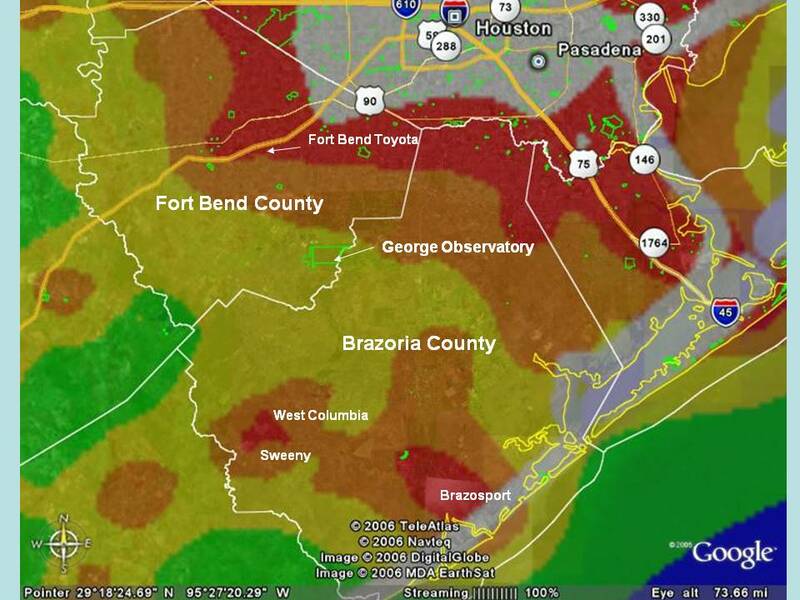 The World Atlas of the Artificial Night Sky Brightness depicting light pollution levels in Fort Bend and Brazoria counties as well as surrounding areas relative to the George Observatory. Scale description: White - entire sky is grey or brighter (limiting magnitude 3-4); Red - Sky grey up to 35 degrees above horizon and Milky Way at best is very faint overhead (limiting magnitude 5.0-5.5); Orange - Milky Way washed out at zenith and invisible at horizon (limiting magnitude 5.6-5.9); Yellow - some dark lanes in Milky Way visible which becomes washed out near horizon (limiting magnitude 5.9-6.2); Green - Milky Way shows much dark lane structure and zodiacal light seen on best nights (limiting magnitude 6.2-6.5). Fort Bend County Outdoor Light Ordinance: Adopted March 23, 2004 by the Fort Bend County Commissioners Court, the Fort Bend County outdoor light ordinance was groundbreaking in that it was meant to regulate outdoor lighting to protect the George Observatory in one of the fastest growing counties in the USA. Successful Texas light ordinances were developed for lower populated towns and counties, and the FBC Commissioners Court knew what worked there might not work the same in Fort Bend County. However, through a diverse group of businesses, public officials and the George Observatory the Fort Bend County ordinance made adjustments to areas of large populations and growth through four amendments: Amendment No. 1 - April 25, 2005; Amendment No. 2 - February 7, 2006; Amendment No. 3 - June 13, 2006; and Amendment No. 4 - August 29, 2006. The ordinance has worked quite smoothly since Amendment No. 4. Fort Bend County has assigned their engineering department the task of overseeing the application of the light ordinance. Fort Bend County adopted a "one-stop permitting" that includes all permits required for construction. The light ordinance does not require permitting, but is now a part of this process and results in fewer construction sites "falling throught the cracks" which happened frequently early on after the ordinance's adoption. Please call Louis Hood, P.E. (281-633-7510) to either report violations or to discuss the light ordinance. Some question whether outdoor lighting ordinances can work. The people of Flagstaff, Arizona began protecting their night sky over 50 years ago with the first outdoor light ordinance with spectacular results to show for it even today. Fort Bend Toyota has opened a complex on the southeast corner of SH59 and the Grand Parkway and they are in compliance with the light ordinance. If you stop by their facility, make sure to congratulate them on caring about their community by following the outdoor lighting standards set by the ordinance. The CEO of Sterling McCall was very supportive of the ordinance to protect the George Observatory when I spoke to him and they followed through on their word. Sterling McCall owners have always been very supportive of the Houston community and surrounding areas including Fort Bend County. Brazoria County Outdoor Light Ordinance: With the Fort Bend County outdoor light ordinance working smoothly, the director of the George Observatory will request the Brazoria County Commissioners Court to adopt an similar outdoor light ordinance for Brazoria County, which is currently experiencing great growth in it's unincorporated areas. This is expected to occur in mid-2008. We have found that subdivision developers have already approached the Brazoria County Commissioner's court voicing opposition to the light ordinance. They are not against full-cutoff street lights nor illumination levels, but are against being told what to do in fear that it might somehow cut into their net profit. The best rebuttle against this is 1) the full-cutoff street lights cost no more than other streetlights and prevents glare onto houses; 2) proper illumination levels will significantly save the home owner's associations money in operating the street lights; and 3) the developers will come and go, but their misuse of outdoor lighting will persist for years to the detriment and quality of life of the people buying their homes. This web site will serve as a resource for those interested in lending their support to the Brazoria County Outdoor Light Ordinance, once it is proposed to the Brazoria County Commissioners Court. As with the Fort Bend County light ordinance adoption, your help will be needed here too. Fort Bend County, as one of the most rapidly developing counties in the USA, has now established community standards for outdoor lighting in its unincorporated areas where development is strongest. Incorporated areas within Fort Bend County are also taking a closer look at the FBC outdoor light ordinance as a best practice as will Brazoria County. Your help is needed to keep the momentum going with adoption of the Brazoria County Outdoor Light Ordinance! Below is a list of the Fort Bend County Commissioners Court members and how they voted on adopting the FBC Outdoor Light Ordinance; however, please note that the FBC Commissioners Court voted unanimously in favor of Amendment 4 to the ordinance and that the ordinance has worked well ever since. Contact: Phil Inderwiesen at tovinder@hughes.net for comments/suggestions /questions about the web page.